Paul is the story of Graeme (Simon Pegg) and Clive (Nick Frost), a couple of English sci-fi fanboys who have traveled to the United States in order to complete the ultimate supernatural road trip. They stop at the San Diego Comic Con first, and then hit the blazing trail to see Area 51, Roswell and other alien hot spots. 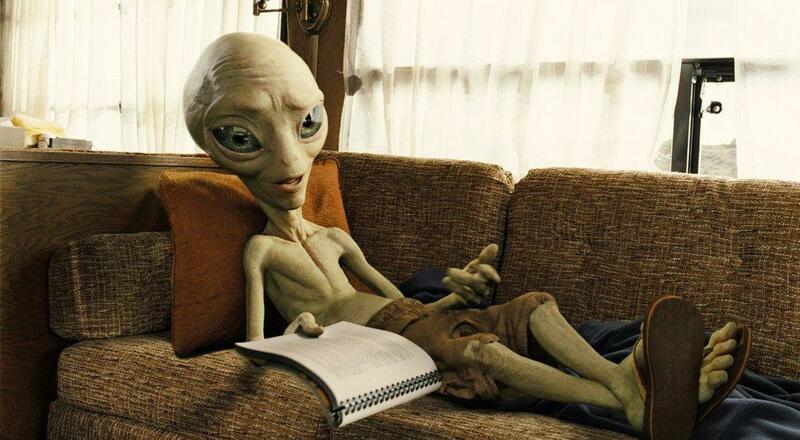 Along the way, they stumble upon an actual alien, Paul, who is on the run from the FBI. Paul, voiced by Seth Rogen, joins them in their RV and has his new-found friends set forth on a new adventure — to get to Wyoming, where he can be sent back to his native planet. So this is another Pegg/Frost comedy, this time without director Edgar Wright at the helm. A lot of people have complained about his omission, but Greg Mottola (Superbad, Adventureland) is more than capable to lead these guys. 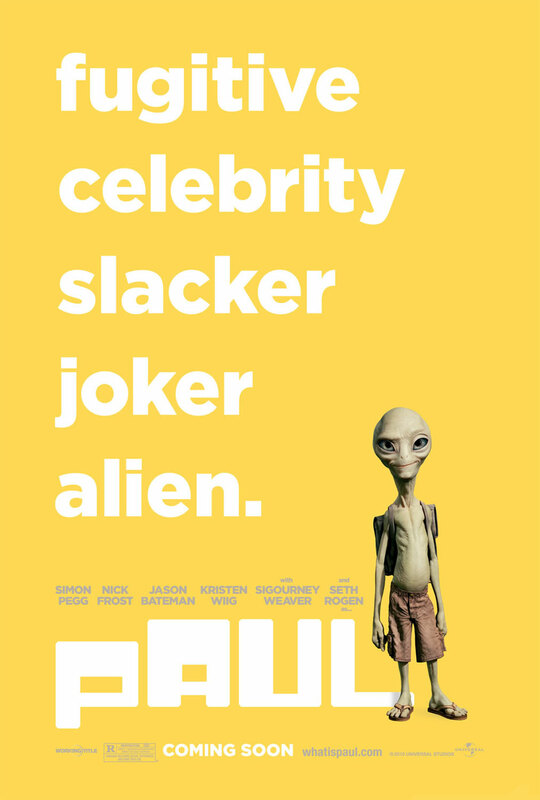 This is a good-hearted spoof, a movie that isn’t overtly hilarious but still maintains its share of laughs, most of which come from the alien Paul. This is standard Seth Rogen in pint-sized CGI form, complete with the pot smoking and beer drinking. Paul’s a likable fellow, a friendly guy full of wisecracks who is always willing to help out those who are nice to him. Pegg and Frost are on top of their games as sci-fi geeks, and there are countless references to the genre within the movie. I am hardly a sci-fi buff, but I noticed more than a few funny “inside” jokes, my favorite of which was a rural bluegrass band playing the music from the famous Star Wars Cantina scene. Fans of science fiction will feel at home here, and you get the sense that both Pegg and Frost are loving every minute of their roles. Our two socially awkward heroes are aided by an impressive supporting cast. Kristen Wiig, Jason Bateman, Bill Hader, and Sigourney Weaver all have memorable roles and provide some fun moments in the movie. Wiig, in particular, is great as the bible-thumping Ruth Buggs, a woman who is first shown on screen wearing a t-shirt of Jesus shooting Charles Darwin in the face. It is also refreshing to see Jason Bateman in a different type of role, this time playing the hard-nosed FBI agent pursuing Paul. Paul succeeds at what it sets out to be — a light, good-natured comedy that pays homage to numerous sci-fi classics. You don’t have to be a fan of the genre to appreciate the movie, although it certainly helps. While a step below Pegg/Frost’s past efforts in Shaun of the Dead and Hot Fuzz, Paul is still an enjoyable movie about a couple of buddies and their new friend, who just so happens to be an alien.